Award Winning CD that shares positive values. 14 Spring, Summer, Fall and Winter Songs that are a perfect addition to your children's cd collection in the classroom or at home or home. Wy Griffith and I are tickled to announce Miss Willow's Fence Row, a 2008 Parents' Choice Award Winner. If you're a parent who's choosy about what your kids are listening to...and like music with an emphasis on positive values, this CD will please you and your children. You will find songs that vary in genre and mood from fun and lively to a few that are more serious yet tenderly written. All gently teach. The animals outside Miss Willow's window seem to work at getting along. If there is some ruffled fur ..(or feathers)..they work it out. Miss Willow's Fence Row is perfect for both home, daycare facility or classroom. Several of the songs have a spring, summer, fall, winter emphasis (Spring Cleaning Time, Berry Berry Good Time, The Babies Are Here, Blessings, Big Blizzard, Snuggled In With Love)and will work well with lesson plans and the school-year calendar. Without God's gifts, I would not be writing. I am very thankful for any gifts or talents I've been given to share.....Thank you God...for your blessings! A big thank you to our families who offered support and encouragement! A big....thank you to my co-writer, Wyman Griffith, who added "just" the right words in so many places! The true-to-life artwork was done by Deb Hoeffner whose art has graced the covers of everything from U.S. News and World Report to children's books..Thank you Deb. Amy Moser, Vocals (Blue Vision Music Studios). Christine Mascott (Syberdelix Records) layout and design. Front Porch CD, Replication. Mike Dunbar, chord charts. Song Coach, Vikki Flawith. Linda P. Adams, Editing and Proofreading. Just Plain Folks where writers & musicians continue to grow. Charlotte Hannon (Atlanta Music Group) mentor and friend, a constant in both encouragement and honesty. Green Valley Studios, (Alison and Richard Rupert) for their help in recording Dragonfly, Snuggled In With Love, Fence Row Lullaby and Bushy Tails and Fluffy Feathers. Fence Row Sheet Music and Activity Book. What a lovely collection of music. These are as charming as any children\'s songs I\'ve heard. Well written, beautifully recorded and sung. Miss Willow\'s Fence Row will become a favorite for you and your children. I wish my son and daughter were still children so I could watch them enjoy these wonderful songs. Wonderful Listening for Kids AND Adults! As a parent of six children, and a musician & music lover myself, I'm choosy about what children's music I play for my kids. I'm keenly aware that what kids love, they play over and over... and over, and over, and over. Kaley and Wy's CD is so delightful and well-produced that it's easy to listen and re-listen to these endearing tunes. I find myself lost in the stories, and picturing myself as a little critter on the Fence Row. It's simply wonderful. I highly recommend it for any age! "Spring Cleaning Time" even gets Moms in the mood to clean house. "Some Day, Some Way" is just lovely... and while it's hard to pick a favorite, we've liked "Dragonfly" from the first time we heard it, early on in the production stages. Just FYI... this review comes from a parent who'd climb the walls if I had to listen to "Baby Beluga" one more time. With all due respect to Raffi, who is talented in his own right... Kaley and Wy are very easy on grown-up ears, and easily surpass the more well-known children's artists out there today. Kudos for creativity, originality, and enjoyability! Great concept, songwriting and production! This CD is sure to delight families with younger kids. More importantly this musical adventure contains a series of instructional messages with spiritual values to spice up the whole package. Perfect for the little ones, families and also big "kids" of all ages! If you've got children under the age of seven (or are searching for a perfect gift for friends with children), this album is for you. Perfect for youngsters (and adults will "secretly" love it too! 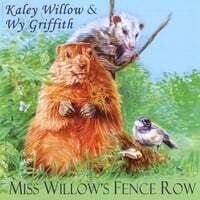 I just have to say that Kaley and Wy have created a delightful listening experience on Miss Willow\'s Fence Row. As I listen track to track there\'s a melting away of my \'adult\' and I am taken back to my child\'s play and imagination. The music entertains in a joyful pleasant way, but there\'s also a depth to the stories and music that an adult listener can really appreciate. Love your singing Kaley and the stories are wonderful. Nice cd that makes a great gift for any family. My best to you! A farm fence row is a neat rural theme.Kids are going to dig this! Your music and lyrics are brilliant as well as the production. My favorites are Cajun Critter, Someday Someway, and Bushy Tails and Fluffy Feathers. We're putting a children's show together in September and we'll try to play several. Thanks for letting us review and play your songs. Good luck. Kaley Willow and Wy Griffith have done it again! Like Andy and Friends, Miss Willow's Fence Row is a lovely album. The lyrics are delightful and the melodies are sweet and upbeat. A wonderful addition to any classroom music library!